If you're looking for some additional storage space, try installing pull down attic stairs instead of investing in a storage shed. Attic storage is a convenient and economical way to make some much needed space for those seasonal or holiday items that are cluttering your closets and cupboards. Most homes have at least a small attic area that can be pressed into service. Pull down attic stairs are available in sturdy aluminum and wood models that can fit ceiling heights from seven to twelve feet. Stairs are load rated for light use at 250 pounds, or heavy use at around 350 pounds. The model you're interested in will determine the types of clearances you'll need, both in the attic and in the room below. If you can't accommodate the area needed for standard sized pull down stairs, there are compact models that will work with your existing ceiling hatchway. Although these are really dedicated, telescoping ladders, they work well in tight spaces, like closets, and can be a quick and relatively easy solution to getting attic access. Although attic stair kit installations are considered do-it-yourself projects, they can be challenging. The stair assemblies are heavy and you'll need to be comfortable with your carpentry skills when cutting the ceiling rough-in, which will be bigger than the access opening you currently have in your ceiling. This isn't a one-man job. To evaluate the area you have in mind, the direction of the joists will be important. The stairs will have to be installed parallel to the joists. Remember, the manufacturer's specifications will give you precise measurements given the ceiling height and model you're installing. Before you start work, read the manufacturer's instructions carefully to make sure that you have the space you'll need to successfully complete an installation. Don't forget to check that you have enough ceiling clearance in the attic to make walking up and into the space practical, and that there isn't any wiring or ductwork in the way. You don't want to realize you have a problem after you've already started cutting into your ceiling. One of the most critical steps in installing attic stairs is making the rough-in square. The old adage, measure twice and cut once, was never truer, and when you're talking about taking a chunk out of your ceiling, it pays to take your time. Never cut joists connected to braced rafters. They're an integral part of the support structure of your roof. Don't cut more than one joist when installing stairs unless you've had the modification evaluated by an engineer. 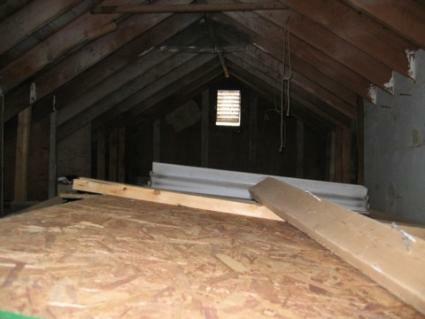 Prep your attic floor before the install by laying plywood in areas near where you'll be working that aren't supported. This will make it easy for you to move around. Rig reliable lighting in the attic to make it easier to see while you work. Once you've completed the installation, you can start taking advantage of all that empty space, but there's something else to keep in mind. Your attic stairs may require additional insulation during weather extremes. There are third party insulating solutions that can be installed over pull down attic stairs and hatchways. When sourcing your kit, ask about insulation, and keep it in mind when pricing the entire cost of the project.